Exfoliate, tan and moisturize. Easy all-in-one application with our revolutionary, patented self-tanning towelettes for face and body. Half body towelettes are 9” x 7” inches in size and are great for face, arms or legs. 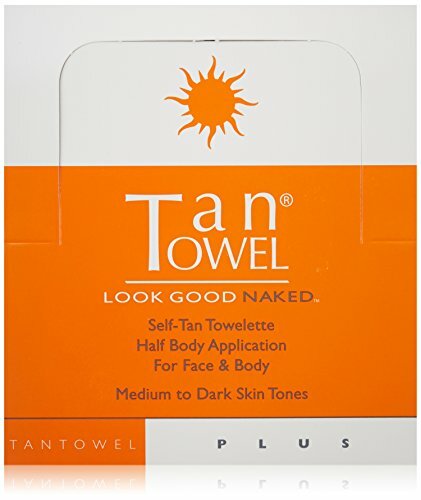 Tantowel towelettes are concentrated with a specialized self-tan formula that works with the proteins and amino acids in skin to produce a healthy and natural sunless tan, unique to you. Ingredients: water/eau, ethoxydiglycol, dihydroxyacetone, butylene glycol, polysorbate 20, phenoxyethanol, benzyl alcohol, sodium metabisulfite, potassium sorbate, tocopherol, tetrasodium edta, citric acid, fragrance (parfum), ethylhexylglycerin, cucumis sativus (cucumber) fruit extract, tocopheryl acetate, melaleuca alternifolia (tea tree) leaf oil, ascorbic acid. If you have any questions about this product by Tan Towel, contact us by completing and submitting the form below. If you are looking for a specif part number, please include it with your message.